1. Preheat oven to 180°C/160°C fan-forced. Cook pasta in a saucepan of boiling, salted water, following packet directions until tender. Drain. 2. Meanwhile, place mince, garlic, onion, basil, carrot, zucchini, mushroom and breadcrumbs in a large bowl. Season with salt and pepper. Using hands, mix to combine. Using 2 level tablespoons of mince mixture per ball, roll mixture into 24 balls. Place on a plate. Cover and freeze for 10 minutes. 3. Heat oil in a frying pan. Cook meatballs, in batches, turning, for 5 to 6 minutes or until browned and almost cooked through. Transfer to a plate. 4. Place pasta and sauce in a 12-cup capacity oven-proof dish. Toss to combine. 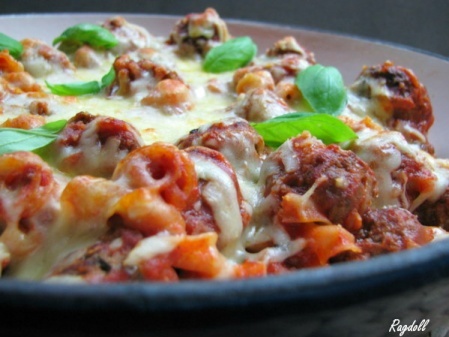 Arrange meatballs on top of pasta. Turn to coat. Sprinkle with tasty cheese and parmesan cheese. 5. Bake for 20 to 30 minutes or until golden and cheese has melted. Top with basil leaves. Serve.